BJP leader Trivendra Singh Rawat was on 18 March, 2017 sworn in as Uttarakhand Chief Minister. 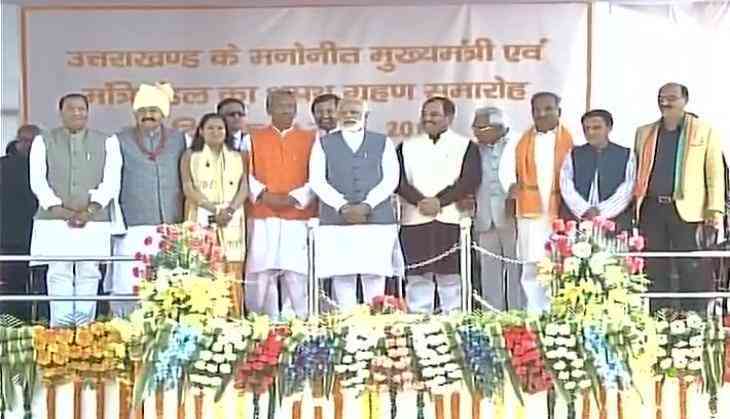 Governor K K Paul administered the oath of office and secrecy to 56-year-old Rawat, a former RSS pracharak, and nine ministers at a ceremony attended by Prime Minister Narendra Modi, BJP chief Amit Shah and other national and state party leaders. Satpal Maharaj, Harak Singh Rawat, Madan Kaushik, Arvind Pandey, Subodh Uniyal, Yashpal Arya and Prakash Pant have been made Cabinet ministers. Rekha Arya and Dhan Singh Rawat took oath as ministers of state. The BJP decimated the Congress in the Assembly election, winning 57 of the 70 seats. Coupled with his administrative and organisational skills and experience, Rawat's loyalty to the party and RSS ideology catapulted him to the top post in the state. Rawat was appointed the party's national secretary in 2013. He was later made co-incharge of the party's affairs in Uttar Pradesh in 2014. He was BJP in-charge of Jharkhand ahead of the crucial assembly election, a responsibility he discharged well to further strengthen the party leadership's trust in him. He had wrested the Doiwala seat from Congress with an impressive margin of 24,869 votes to win it for the third time.